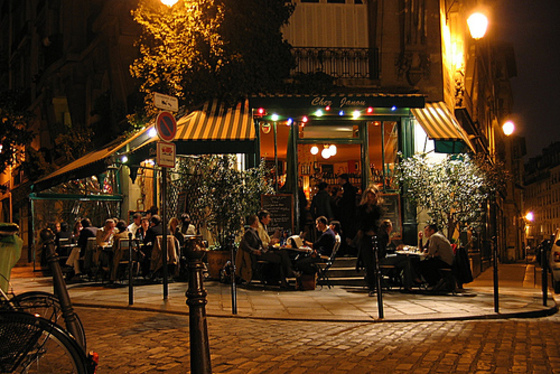 There are bistros on every corner in Paris, and a half dozen in the blocks between. I wonder how each stays in business, and I wonder how you figure out which one's are really good. My two or more gathered theory doesn't always apply to the bistro since there's people in each and every one, though a line out the door or crowd gathered at the door is often a good clue. I did some investigation and started my bistro research by eating in my own neighborhood since you have to have a good, local go-to spot. I had heard many good things about this spot, conveniently located just down the street from me in the 4th, near Place des Vosges. It's quiet location and green awning stretch out over the patio and extend onto a residential lined, cobblestone street. I was advised to make a reservation and tried to do so in person with a waiter who told me I could show up at 10:30 that night, or 8:00 the next, so I took the 8:00, though was slightly concerned as the waiter had plates in his hand, not a reservation book. My friend and I showed up the next day and fought the crowd to the end of the bar to try and let someone know we were there. Some time elapsed until a hostess surfaced, confirmed she had our name, and sat us in the back of the restaurant, which appeared to be the American zone as we heard English voices all around us. Tables are packed elbow to elbow, but the environment is friendly, if not frenzied. Our whole section of about 6 tables appeared to have been sat at the exact same time, which may have slightly overwhelmed our waitress, but she still managed to make things happen, even if it was a bit a la francais. My friend and I both had what turned out to be one of our favorite dishes in Paris to start. She had simple, well cooked mushrooms which were a woodsy melange of vegetables presented in a small, black, skillet, and my tuna must have just swam in the door because the tartare dissolved in my mouth with just a little citrus and ponzu balancing the flavors perfectly. The mussels also seemed like a crowd pleaser as it was on most people's tables. Our main dishes weren't quite as memorable as I had a pasta with escargot in a thick, creamy, bordering on glue-like, sauce. I'm not sure how anyone could eat more than a few bites of the filling dish. My friend received a handful of grilled shrimp sitting by themselves in another cute little skillet, but they were a little lonlier with just some rice served on the side and not a ton of flavor. We were too full for dessert, but most folks come for the bottomless chocolate mousse, served family style out of a large bowl and flung onto your plate until you say stop. Chez Janou is also know for its large pastis selection, so next time, mussels, mouse and pastis! 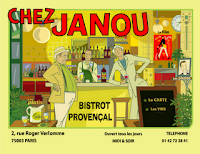 Not too far from Chez Janou, is another good, neighborhood bistro, equally bustling with tables side by side, but also separated upstairs and down. When we called to make our reservation the day of, we were told that we'd have to sit downstairs, but when we showed up we were treated to a window seat front and center upstairs - sometimes two well dressed women can do that, but sometimes not. Our waiter was entertaining and informative, shaking his head when I guessed at ordering a particular wine. He pointed me in another direction and I was rewarded with a fine wine. I started with a wonderful escargot stuffed mushroom, which could have stood a little extra cooking on the mushroom and a little more garlic in the "stuff," but nice nonetheless. I then moved on to a most surprising and fantastic casserole with perfectly cooked, curry lamb, layered in with aubergine, vegetables and more spices with a crispy top layer - divine. My friend had a lovely cooked duck, but the piece de resistance were the scalloped potatoes slathered in cream and cheese to eat alongside. Our dessert ended up being more wine as we became big fans of the wine the waiter recommended!